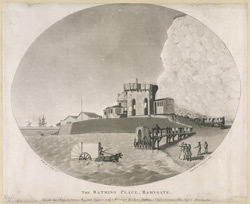 In the mid-18th century, Ramsgate became a popular bathing spot. Doctors encouraged wealthy patients to bathe in seawater to cure illness. With attractive sandy beaches, Ramsgate was an accessible seaside destination for Londoners. The engraver, V Green, described himself as "Mezzotinto Engraver to His Majesty & to the Elector Palatine".